Generala (or "General") is a dice game played with five six-sided dice. It is a Latin American version of the commercial game of Yahtzee (or Yacht). The game has only one "straight", and it can be either 1-2-3-4-5 or 2-3-4-5-6. It counts for 25 points if it's a "natural" (on the first throw), or 20 points if made on the second or third throws. A full house is worth 35 points on the first throw, 30 points on subsequent throws. A four-of-a-kind is worth 45 points on the first throw, 40 points on subsequent throws. Five-of-a-kind is called a "generala". If you roll it on the first throw, it's called a "big generala" and wins the game outright. If you roll it on the second or third throws, it's known as a "small generala" and is worth 60 points. There is no "Three of a Kind" category. There is no "Chance" category. There is no bonus scoring. A player may choose to take a "0" for a category score. This is known as a "scratch". However, if the "Generala" category has been scratched, and the player then rolls a five-of-a-kind on the first roll, it is not an automatic win. The player with the highest score after filling all categories is the winner (unless, of course, a "Big Generala" has already decided the game)! Some play that a straight may "wrap around", so 3-4-5-6-1, 4-5-6-1-2, 5-6-1-2-3, and 6-1-2-3-4 are also valid straights. 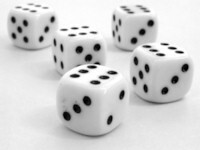 Some players allow a "1" to be a "wild card" in a straight, so that, for example, 2-3-1-5-6 would be a valid straight. A bonus may be earned by rolling a second "generala" in the same game. This is known as a "Double Generala", and is worth 120 points if accomplished on the first roll, and 100 points on subsequent rolls. A first-roll Double Generala is not an automatic game-winner.